Ready to dip your toes into the deep and exciting quilting waters? Then this is the class for you! 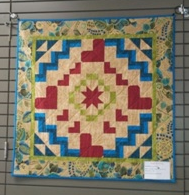 Everything you need to know to get started can be found in this class with Laurie, from your perfect ¼” seam allowance, to chain piecing, to making accurate half square triangles, to sandwiching, machine quilting and binding. You will be hanging this beauty in your home with pride!